Workers at a port in Washington State are reviving strike tactics that have become nearly extinct in American labor struggles—and they may just win. 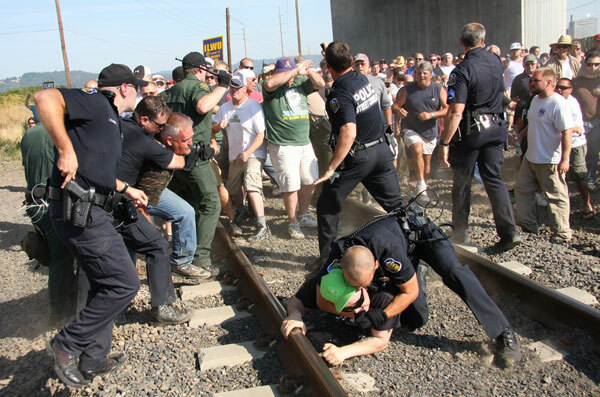 Police face down workers standing on railroad tracks in Longview, Washington September 7. Image courtesy of Dawn Des Brisay. Seventy years ago, the actions that got these workers arrested were commonplace. But over the past half century, such tactics have become nearly extinct in the American labor movement. American strikes have severely declined, not only in number (the 2000s saw one-seventeenth the number of major strikes in the 1950s) but in militancy. The strikes that do take place now are shorter in duration and far less likely to shut down the operations of the workplaces they target. That makes the Longview workers’ struggle exceptional—and instructive—because they may just win. As the Occupy Wall Street protests attest, unions didn’t stop striking because they brought big business to heel. Rather, plummeting union membership and the contraction of strikers’ legal rights have led to fewer, shorter and less potent strikes—and an economy in which workers have worse compensation and a weakened voice. As amended by Taft-Hartley, the National Labor Relations Act prohibits labor’s most effective strike tactics: massive pickets, spreading the strike to other sites within the industry or other industries within the supply chain, occupying your own worksite so no one else can do your job. In his recent book Reviving the Strike, veteran Communications Workers of America union negotiator Joe Burns argues that the decline in effective strikes is the cause of falling union membership, not the consequence. “No matter how militant the union is,” Burns told me, “it’s almost impossible to effectively fight back if you follow the content of labor law.” Instead, he argues, workers should refuse to comply. That’s what Longview’s longshore workers are doing. The International Longshore and Warehouse Union has a long history of production-halting actions that defy legal constraints. In recent decades, ILWU members have shut down ports in protest of deaths on their docks and in opposition to American wars in Afghanistan and Iraq, apartheid in South Africa and attacks on public workers’ collective bargaining. Faced with a threat to their job security, Longview longshore workers are continuing this tradition. ILWU members have worked the Longview Port for decades, including operating its grain operations. In 2009, the port signed a lease—featuring local and state subsidies—with an international consortium called EGT to build and manage a new $200 million grain terminal. After beginning negotiations with the ILWU, EGT broke off talks in March and moved instead to staff Longview as the only West Coast grain operation without ILWU members. The union held protests and joined the publicly owned port in suing EGT for violating a contract clause requiring ILWU labor. But starting in July, rather than waiting for the courts while EGT kept the trains running without them, ILWU members repeatedly sat down on the tracks to prevent grain from passing. Workers continued coming back after a federal judge issued an injunction in early September ordering them out of the way. In a stark reminder of the legal barriers to old-school activism, on September 30 the judge imposed a $250,000 fine on the union, with threats of hefty future fines on individual protesters. Since then, workers have met two grain shipments with protests that did not prevent their passage. It’s too soon to say which form future protest will take. But it’s already clear that rather than let the crisis stay confined to their families, longshore workers have created a crisis for the city. The town sheriff and county commissioners have pleaded with a judge to expedite a ruling (otherwise slated to take months) on whether EGT has to bring the workers back. Could the Longview struggle lead more unions to follow suit, reviving tactics that were far more prevalent when the labor movement had far greater strength? University of California, Santa Barbara, labor historian Nelson Lichtenstein points out the structural advantages of workers in the longshore industry, where labor is a tiny fraction of costs, globalization has benefited the workforce and ports serve as bottlenecks for global commerce. That means workers in many other industries face greater obstacles to effective strikes. When 25,000 railroad workers voted on October 3 to strike, for example, President Obama exercised his authority under the Railway Labor Act to deny their right to a work stoppage. For a labor movement on the ropes, a greater resort to aggressive solidarity actions may be the worst choice—except for all the other ones. The recent abuse of RICO law to curtail unions publicly shaming anti-union companies is just the latest example of the past century’s trend: every effective union tactic eventually comes under legal threat. Declining unionization makes organizing new members even harder, weakens the impact of remaining legal tactics and hurts the bargaining position of remaining union members while strengthening right-wing efforts to foster resentment against them.